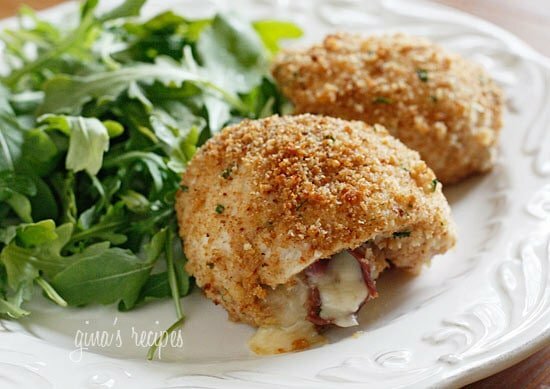 Chicken cutlets dipped in lemon and olive oil, gently coated in a combination of bread crumbs and romano cheese then rolled with prosciutto, cheese and red onion and baked until golden. Serve this with a simple arugula salad or tomato salad for a complete dinner. I try to make a dish from my friend Julia’s blog a few times a month to get show her some love, but also because she’s a wonderful cook and I know her recipes won’t fail me. I’ve had my eye on this one for a while, a perfect way to make chicken breasts if you’re tired of the same old thing. I loved using olive oil and lemon juice to dip the chicken in before the breadcrumbs, it really added to the dish. There is no need to season the chicken with salt, the prosciutto gives you all the salt you need. 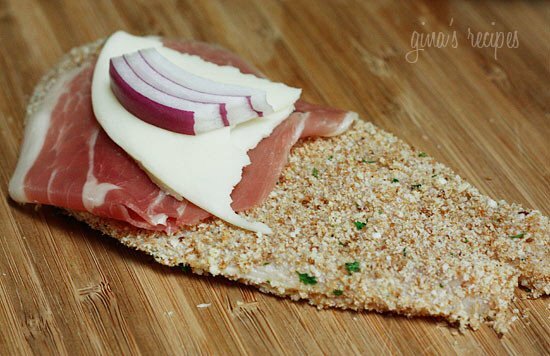 If you are watching your sodium, use low sodium ham in place of the prosciutto and use unseasoned breadcrumbs or make your own instead. 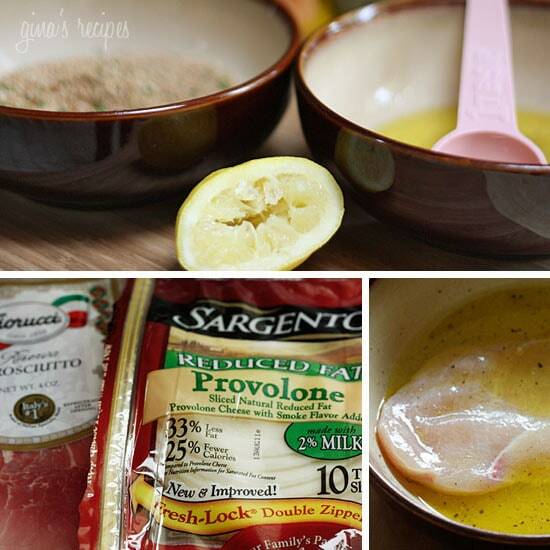 I used Sargento reduced fat provolone cheese which was wonderful and really complimented the prosciutto! 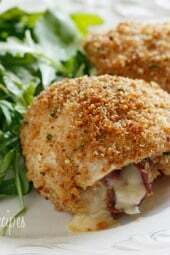 A few other chicken breast recipes you may like: Lighter Chicken Saltimbocca, Baked Chicken Cordon Bleu, Spinach and Feta Stuffed Chicken and Broccoli and Cheese Stuffed Chicken. Wash and dry cutlets well with paper towels. Combine breadcrumbs and grated cheese in one bowl and olive oil, lemon juice, and pepper in another bowl. Roll and place seam side down in a baking dish (no toothpicks needed). Repeat with the remaining chicken. Serving size is listed as one, but if you are having this as a low carb meal with a salad, I suggest you have two. Delicious recipe. I made exactly as written and everyone loved it! These are just way too freaking good! Making them again tonight! I use light Swiss as that’s what we usually have on hand. Another amazing recipe! I used panko breadcrumbs (to avoid the sesame in regular – DH allergy) and light Swiss cheese which is what I had on hand. Incredible! I always worry about stuffing being inside the chicken and not getting cooked all the way. But you have the chicken so thin, and then bread it before adding the ham & cheese – i look forward to trying these. Gina, any tips for making these freezer friendly? Delicious! I substituted swiss because that’s all I had and minced the onions just because I prefer the texture better. So good! Hi! I love , love, love your recipes and so does my family!!! But………they need sauce with chicken that is rolled and baked. Any recipes? Had these tonight for dinner. So delicious — and easy too! I love the olive oil and lemon in the breading process instead of eggs. Is there anything you would recommend to substitute for the bread crumbs? Made this last night and it was great! I had never really thought of the flavor combination but this will definitely be going in the dinner rotation. I prepared the entire dish the night before, put in the oven the next evening and it turned out perfect. Can I use another type of vegetable with it besides onions? Gina, I made these last night and they were amazing! I am making them again for my mother's birthday. The hint of lemon, and salty-ness (is that a word?) from the prosciutto and cheese makes a wonderful combo! Thank you for all of your delicious recipes!!! Your link to Julie's blog doesn't work… just thought you'd like to know (: I googled her and found her website and can't wait to explore it! (: Thanks for the recipe! Just made this for dinner and it was a hit with the BF! LOVE that all the information is already in My Fitness Pal. The recipe was incredibly easy to follow and all of your pictures makes for a stress free experience. THANKS! Keep up the good work! Just had this for dinner and my family loved it! Will definitely make this again. Very delicious! I made this recently, and it is so far my favorite recipe from SkinnyTaste! I used shredded mozzarella cheese and served with pasta. This was tonight's dinner…I always used to fry these then finish in oven. My family loved them without the frying. My husband commented how much lighter and tastier they were! Made this tonight. YUM! I enjoyed every bite and probably could have eaten everything in the baking dish. I served it with the cauliflower puree and a mixed greens salad. Awesome! Made this last night, what a treat! I've been making my cutlets with egg dip for years…who knew olive oil/lemon juice would be so wonderful! Thank you so much. made this tonight, with mozzarella cheese, it was amazing!!! all the recipes so far that I've made from here have been great! Our family loved this recipe,especially my 2 teenagers. They didn't think I made it, thought I ordered it from a restaurant-LOL! and it was so simple. Thanks Gina! Just made this for lunch. It was delicious. I used swiss cheese because it's what I had. Can you prepare these a few hours ahead? So amazing! Just made for a low cal and low fat dinner option for me (watching my weight) and my husband loved it too! Awesome and easy! Made this for dinner and used thinly sliced pork. It was delicious. my god woman i just need the serving size and ingreedents!!! Easy to do, and tastes pretty good. Just wondering – in the ingrediants you say use 8 3oz cutlets. I assume that means 3oz raw right? I know the NI and pointsplus you list are based on cooked weight. But wanted to make sure your ingrediants lists are always raw. I'm allergic to lemon. Can something else be used or can it be cut from the recipe completely? I didn't use the lemon and it still turned out delicious! Made this for dinner last night and my husband loved it. Another wonderful Skinnytaste recipe to add into the rotation! Would it matter in taste and points if I substitute the sliced mozzarella cheese for fat free shredded mozzarella? Otherwise I'd have to slice Gouda into it. Thank you in advance. Made this tonight for my nanny family. It was very delicious!!! Thanks for sharing. I think I shall make it again this weekend!!! This was sooooo good! I seasoned my chicken first (w/ salt free seasoning) and rubbed the seasonings on the meat. The onion added so much flavor. Will def make again. This sounds delicious! Would the cooking time differ if making veal or pork? I made this for my family last night. I used asparagus rather than red onion. It was fabulous and quite fast. My picky 4 year old even like the chicken (because of the breadcrumbs, I'm sure!). Served it with a big salad and everyone was happy! YUM! This looks amazing! Gina, what would be the best way to make this dish and freeze it to eat another day? Would it be best to bake first then freeze or freeze the rolls uncooked? Thanks! Made this today and came out great. I didn't have prosciutto so I used serrano ham and also added some roasted red pepper, loved the olive oil/lemon mix instead of egg. The kids don't like melted cheese or onions therefore I just used ham in theirs they loved it. Served it with red pepper rice, thanks. Made this tonight with your cilantro/lime rice. So versatile. With five of us in the house finding a dinner that pleases everyone is very difficult. I made DH's according to the recipe but for mine I used sundried tomato instead of red onion. My middle and youngest sons did not like the sharp provolone, so I used mozzarella on theirs. My oldest does not like melted cheese, so I just used the proscuitto and some sliced jalapenos on his. Viola! It was like making custom meals but so easy and everyone raved about it. This was incredible! I've been making your recipes for the past 3 weeks, and they are all fabulous. This one was particularly fantastic and thus my first comment on your blog. I had some meyer lemon infused olive oil and used it with some homemade breadcrumbs from 2 crusts of bread and italian seasonings and grated parm. Gina, almost all your recipes are so simple to prepare. I have a 2 yr old and an 8 month old at home and am still able to prepare fresh dishes each night, and freeze leftovers. I love that we are eating more healthily than ever even if I make slightly higher calorie or fat substitutes based on what's in the house. You've changed the way I approach food in the house. It's exciting and tastes better than most meals I've made since I started cooking 7 years ago. Thank you so much! Made this last night, another recipe that you knocked out of the park. That's the 3rd Skinnytaste dinner in a row, thanks Gina! I'd like to make these and freeze, would you cook prior to freezing or after thaw? Do you think they would get less crunch on top? I made these last night and they were fantastic! 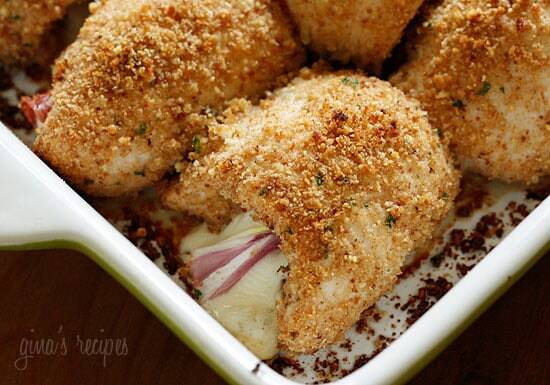 Used regular italian breadcrumbs, and added some garlic powder to the chicken breasts before dipping. Served with the roasted cauliflower recipe on this site. Delicious! Hi Gina!!! 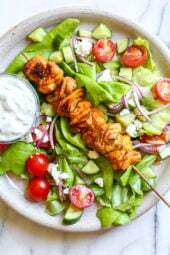 I'm from Brazil and however some ingredients are quite dificult too find here I did some tiny modifications, and i just made this recipe for lunch!!! ohh it was so good!!! everybody loved it !!! Certainly I will be making it again very soon!!!! Congrats your recipes are the best!! We make this in larger batches and freeze them individually. You can bake at 400 for 30-35 minutes. 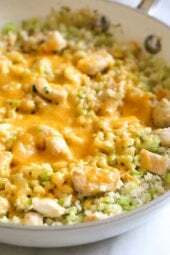 They are absolutely wonderful and make an easy weeknight dinner once prepared and frozen. This sounds delicious, would this work with boneless skinless chicken thighs? This was wonderful and so easy, too! Another hit in our household! My husband was really impressed – the funny part was the day before he complained about that awful low fat provolone cheese in the fridge. But funny how good it tasted melted next to some prociutto. I was interested to see all the comments about the lemon – I normally hate lemon chicken but I didn't taste it at all here. I was suprised how simple and quick this was to prepare. I'm so used to cooking chicken on the stovetop – it was nice to just stick this in the oven. This was FANTASTIC and SO EASY!! Really appreciate easy, healthy dinner recipes!! Will be adding this to our staples! I made this for dinner over the weekend; AMAZING! My husband loved it. I am so thankful to have found this recipe. I also left out the onion (boyfriend does not like) but subbed some fresh basil instead. I paired it with roasted cauliflower for an absolutely delicious meal! 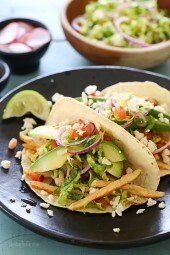 I just discovered your site and I am so excited to try this recipe tonight. You make eating healthier so much easier! Thank You!! This was fantastic! I made it tonight for Valentine's Day Dinner along with your mushroom risotto and a light salad. Yummy! My husband and I just decided to go on weight watchers, and I've been scouring the internet for some good recipes. We ate this dish last night and raved every second, the tart lemon, smokey proscuitto, and rich-tasting mozz (fat free was glorious), only omitted the onion, and were two very happy campers. Oh, and we had your chocolate cupcakes with glaze for dessert, which were so freaking good. Looking through your blog to see what to make tonight! Thank you, thank you, thank you. Wow!I had been wanting to make this for my bf for quite some time,and we just finished eating it. Delicious!! As are all of your recipes. I was naughty,and had 2, and I am so incredibly stuffed now. The only substitution I made was swapping sun dried tomatoes for the proscuitto.The lemon addition to the breadcrumbs…amazing. Gina, I LOVE all of your recipes, thank you! Tacara, if you don't eat pork you could make one of my other stuffed chicken recipes. I have lots! 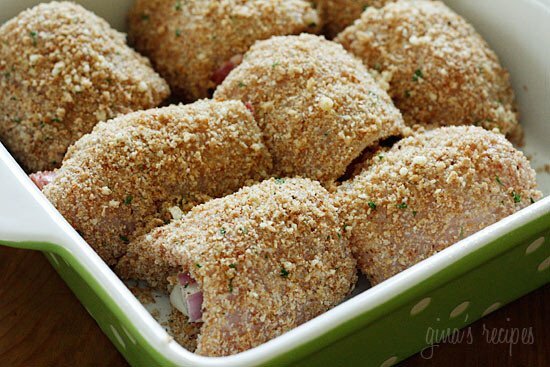 Gina – we have now made every one of the stuffed chicken recipes you have listed and they are all AMAZING! We keep a "stash" in the freezer for weeknight dinners and have been coming up with ingredient combinations staying within the calorie profile. It's been a game changer in my house. Thank you! I just made these for my husband and I and they came out amazingly! I omitted the onion but they were perfect without. Thank you so much for everything you do! This look delicious! I don't eat pork, but I'm going to give the recipe a try with bresaola.